6th Avenue at 32nd Street, Tucson. Ninth in a series of profiles of the Big Jump Project’s 10 focus areas. When it entered the 21st century, Tucson was the bike-commuting capital of the United States. Flat, dry and cool in the mornings and evenings, Arizona’s second-largest city has always had a good environment for bike transportation. 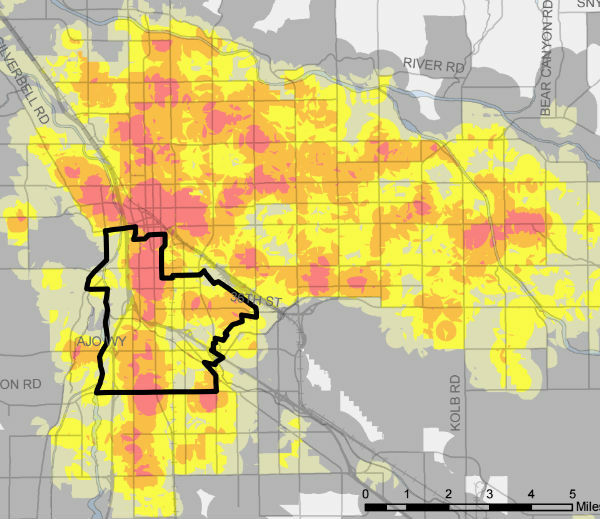 So after the city started striping bike lanes and installing bike-and-foot-friendly crossings of major streets in the 1980s and 1990s, bike commuting jumped to what was then a very unusual 3 percent of the working population in time for the 2000 Census. 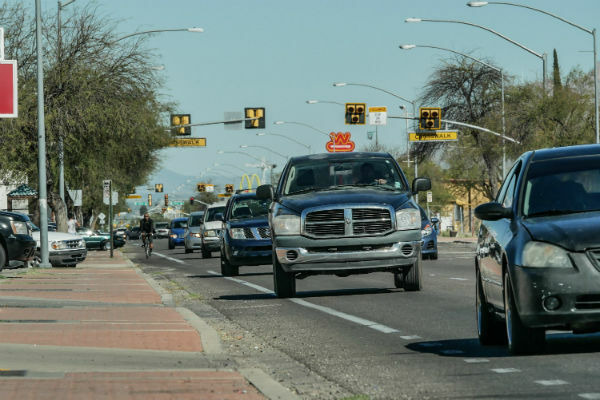 Then other cities, noticing Tucson’s success at boosting biking, started improving their own infrastructure — and left Tucson in the dust. 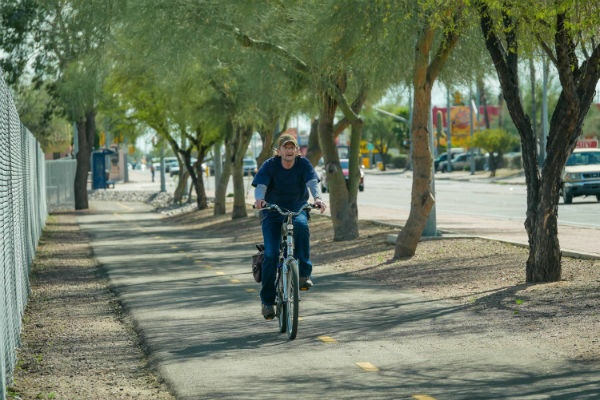 Now, Tucson is working to make up for lost time by joining off-street paths, protected bike lanes and bike boulevards into a network of truly comfortable bike routes: ones that feel good on the street rather than just looking good on a map. 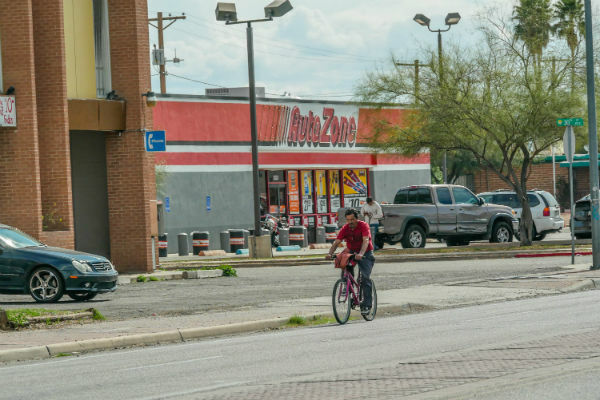 For the next three years, Tucson is focusing this effort in an area that it’s calculated has the highest potential for more biking: South Tucson, an area with relatively lower incomes and car ownership rates than the city as a whole. Many residents are Mexican-American, Native American or both. The main components are the new El Paso and Southwestern Greenway, a walking-biking path that’ll run just north and east of Interstate 10; a Liberty Avenue bike boulevard, constructing in 2018 south of I-10; an 8th Avenue bike boulevard, starting in 2019 north of I-10; and, crucially, protected bike lanes on 10th Avenue to connect the system across I-10. 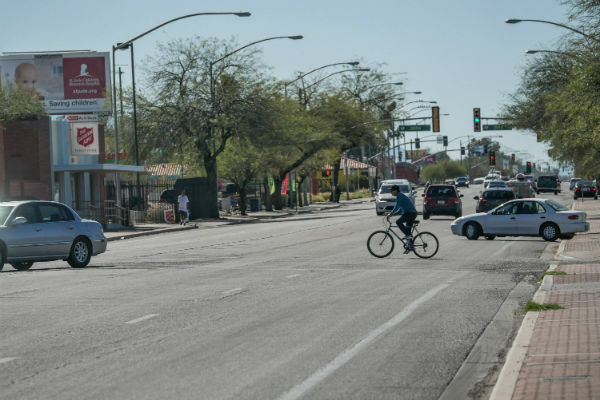 At the intersection of all these bikeways in the city’s Big Jump focus area is the City of South Tucson, an independent municipality of 1.2 square miles surrounded by Tucson proper. Cascio said one of the biggest barriers to biking in the area isn’t infrastructure itself, but the image of biking among many residents. 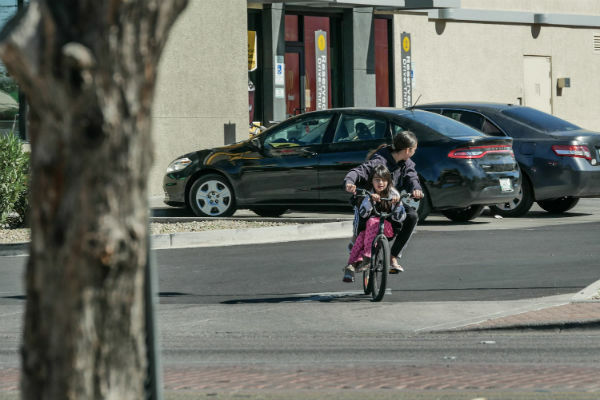 “All they’ve learned and all they know is the American dream is to own a car,” Cascio said. “While to some a bicycle is a real source of freedom and health and there are a lot of good feelings that go with that — to others who are bicycling out of necessity, it can also be a sign of oppression,” she said. 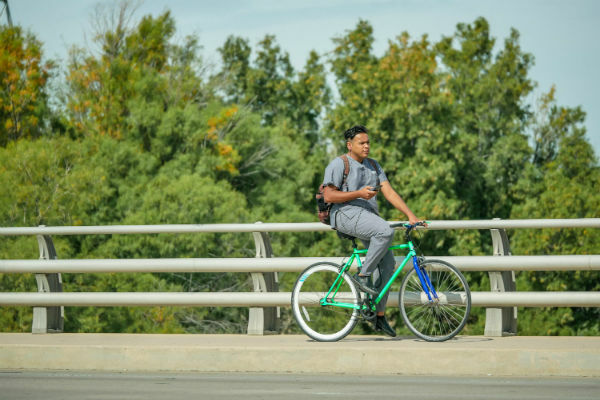 But both Cascio and Chanecka feel that all-ages bikeways can combine with appealing experiences and messages that show the benefits of biking — in particular, for children and families — to bring more dignity to the activity. For Tucsonites in their childhood and teen years, the benefits of biking can be visceral, Cascio said. 6th Avenue at 39th Street. Chanecka said that making mobility easier, safer and more affordable would benefit every Tucsonan. > And the #1 city for everyday biking is?